For those of us in the field of sustainability, the Circular Economy is not a new concept. However, when it comes to the Circular Economy and plastics too often there is a misunderstanding of how the two relate. The Circular Economy is used as simply a re-branding of recycling. The idea that recycling will solve the plastics dilemma is a misguided direction that has been pushed for decades. To achieve a sustainable plastics economy, we must understand the Circular Economy and refocus the vision. The Sustainable Plastics Economy is a guide, written for those wanting to implement the Circular Economy within the plastics industry, providing a deeper understanding of the Circular Economy, and a vision beyond simply recycling. It is a method to replicate the efficiency of nature as intended in the Circular Economy. 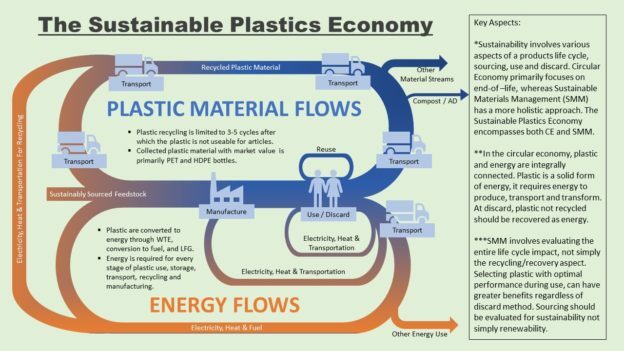 The Sustainable Plastics Economy integrates a complete Circular Economy approach with the unique challenges of plastic. It includes the concepts of Sustainable Materials Management by addressing the full life cycle impact of various plastic options such as, what types of materials to select, where to source raw ingredients, waste infrastructures, and customary discard scenarios. The Sustainable Plastics Economy creates a dynamic, data driven approach to create a system designed to replicate and ultimately integrate into nature, as intended in the Circular Economy precept. The link below allows for a complimentary download of the Sustainable Plastics Economy guidebook. This guide provides an overview of the Circular Economy concepts and introduces the Sustainable Plastics Economy. Also included is a five-step process for organizations to implement the Sustainable Plastics Economy in a practical and pragmatic method. This entry was posted in Environmental News, Plastic news, Recycling, Thought Provoking and tagged circular, energy, plastic, recycling, sustainable on December 20, 2017 by Teresa Clark.